The Monaco 2 Tier Cascade is a traditional classic water feature. 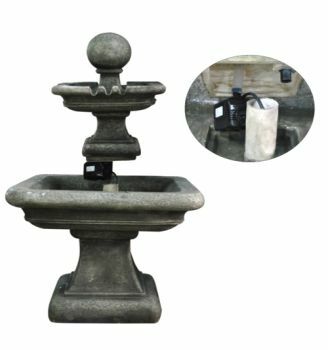 Its compact design makes it ideal for garden installation or on a patio but can also be used in an indoor setting if preferred. 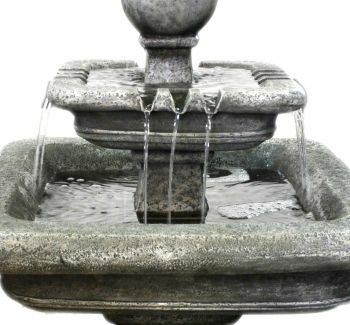 The concealed reservoir contains the supplied pump, which transports the water through a hidden hose to the top of the sphere from where water then cascades back to the hidden reservoir. The Monaco cascade is designed using a special blend of robust polyresin and stone, offering excellent weather resistant characteristics but minimising the weight usually associated with stone water features. The box contains all the necessary parts needed to easily set the feature up and includes water pump and 10 metres of cable. 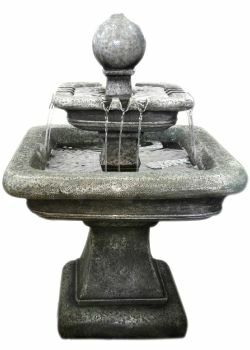 Monaco 2 Tier Water Fountain Dimensions: H880mm (35") x W620mm (24.5") x D620mm (24.5"). Weight Approx 37Kg (82lbs).